Iliza is one of today’s leading comedians with a fan base who show their loyalty by creating their own Iliza inspired swag to wear to her shows. She recently completed hosting her late night limited run talk show “Truth & Iliza,” on Freeform (formerly ABC Family). The self styled talk show is a cross between social commentary, politics, pop culture and Iliza’s specific brand of feminism. In November 2017, she released her first book Girl Logic: The Genius and the Absurdity (Hachette Book Group) a subversively funny collection of essays and observations on a confident woman's approach to friendship, singlehood, and relationships. Iliza’s fourth Netflix special Elder Millennial will premiere later in 2018 and she’s currently filming the Paramount Pictures film “Instant Family,” starring Mark Wahlberg and Rose Byrne. Originally from Dallas, Iliza moved to Los Angeles after graduating from Emerson College. She is the only female and youngest comedian to hold the title of NBC's Last Comic Standing. Her debut one-hour comedy special, War Paint, reached #1 on the iTunes charts and was named one of its Top 10 Albums of 2013. Iliza’s follow-up, Freezing Hot, a Netflix Original Comedy Special, sealed her title as one of the hottest touring acts in America, with Esquire Magazine listing her as one of the top working comedians today. In September 2016, Iliza premiered her latest Netflix special, Confirmed Kills, which finds the comedian in top form, tackling poignant topics while not trading on laughs. She recently wrapped up her first 15 city national theatre tour with “Iliza: The Confirmed Kills Tour” and is currently readying her next stand-up special. 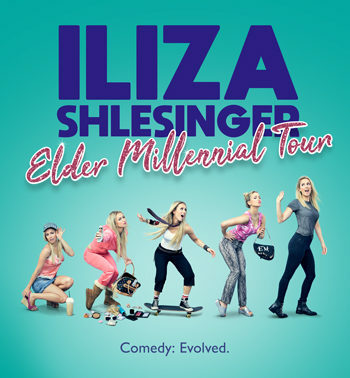 For the second year in a row, Iliza was recently feature in Elle’s “Women in Comedy” annual issue and her television credits include multiple appearances on “The Tonight Show with Jimmy Fallon,” “The Late Late Show with James Corden,” “The Today Show.” Additionally, her digital scripted series, Forever 31 is currently streaming on Hulu.